Night Garden Collection #2 Fragrant White Flowers - 4 packs for the price of 3! Four varieties of seeds for lovely WHITE flowers for less than the price of three! Perfect for your night garden to attract hummingbird and hawk moths and add wonderful fragrance to the evening breeze! You'll get one individual (not mixed!) pack of seeds for each of the following flowers. Full planting instructions will be included for each variety. These are perennial tubers with fragrant 2 trumpet shaped blooms that come out in late afternoon and stay open until early morning. They can be grown in full sun or partial shade, and can get to 3" - 4" tall by their second or third year. Because they are tubers, they tolerate infertile soil, drought, and neglect. Large seeds are easy and fun for everyone! Hardy to USDA zone 7b (+5 degrees F). Treat as a self-sowing annual in colder zones or lift root and store like a tender bulb for replanting in the spring. This close relative of the morning glory has similar heart shaped leaves that are a rich green and 4 to 6 inches long. They provide a beautiful backdrop for the spectacular, fragrant moonflowers. This vine could just as well be called the evening glory as its buds open in late afternoon and last only until morning's light. Moonflowers make up for the short duration of individual flowers by producing lots of large (5-6 across) blossoms throughout the summer. Other common names are: Hindu Datura, Indian Apple, Sacred Datura, Thorn Apple. 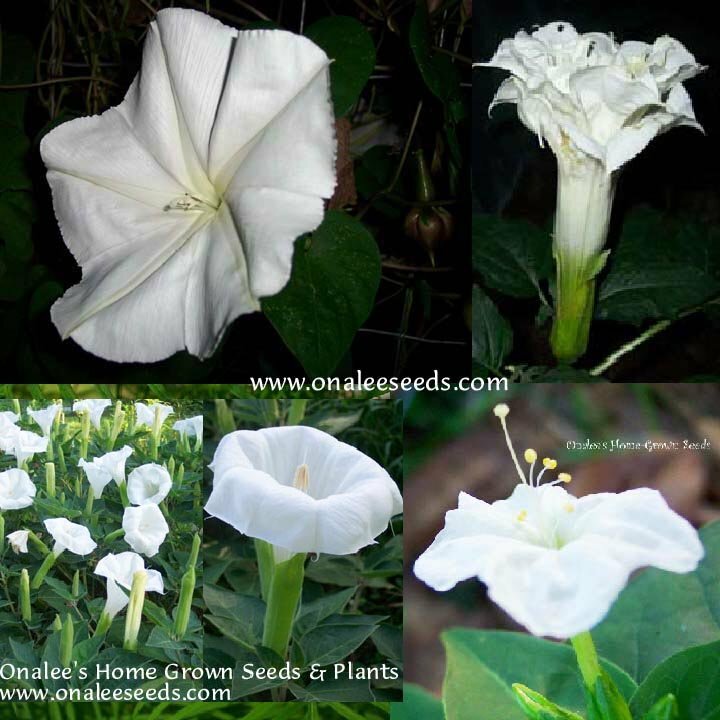 These have VERY fragrant, large (8-10) white, single trumpet shaped blooms that face upward opening in the evening and staying open until the sun fades them the next day. PERFECT for a NIGHT GARDEN! Planted in a group, these flowers are very IMPRESSIVE with their huge, pure white blooms facing the heavens each night! Each plant will grow to a height of 4" and a width of 3" and will have multiple blooms at any given time and bloom continuously throughout the summer. Plant in full sun or mostly sun, but too much shade will limit the blooms you get on this beauty! 24+ TRIPLE WHITE DATURA / DEVIL'S TRUMPET (Datura metel) SEEDS. These have fragrant, TRIPLE white trumpet shaped blooms that face upward opening in the evening and staying open until the sun fades them the next day. PERFECT for a NIGHT GARDEN! Planted in a group, these flowers are very IMPRESSIVE with their large, pure white blooms facing the heavens each night! Each plant will grow to a height of 4" and a width of 3" and will have multiple blooms at any given time and bloom continuously throughout the summer. Plant in full sun or mostly sun, but too much shade will limit the blooms you get on this beauty! Datura?s produce several seed pods during the year and thrive in high heat, particularly in humid areas. Very attractive to butterflies, hummingbirds and sphinx moths (hummingbird moths). This is an annual but will self-sow for next year if you let the seed pods fall to the ground. Note: For the purposes of qualifying for bonus seeds, each 'Collection" is considered ONE order of seeds. Thank you!